Bristol City have signed Wolves winger Michael McIndoe for an undisclosed fee. The 27-year-old has agreed a three-year contract with the Ashton Gate club after failing to become a first-team regular at Molineux. 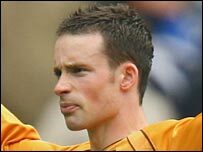 He joined Wolves from Barnsley on loan in November 2006 and then made the move permanent in January 2007. McIndoe told Bristol City's website: "After speaking to the manager Gary Johnson it didn't take me 10 minutes to decide I wanted to come here." McIndoe played under Johnson when the pair were at Yeovil Town before the winger moved to Doncaster.